Agricultural soils can act as a potential sink of the increased carbon dioxide in the atmosphere if managed properly by application of organic manures and balanced fertilizers. However, the rate of carbon (C) sequestration in soils is low in warm climates and thus the short term changes in soil organic carbon (SOC) contents are almost negligible. Therefore, the knowledge about other C fractions that are more sensitive or responsive and indicative of the early changes in SOC can help to determine the effect of the management practices on soil C sequestration. The objective of this study was to determine the soil C sequestration after 16-years of applications of chemical fertilizers and farmyard manure (FYM) to rice (Oryza sativa)—cowpea (Vigna unguiculata) rotation system in a sandy loam soil (Typic Rhodalfs). The treatments were—(1) one control (no fertilizer or FYM); (2) three chemical fertilizer treatments [100 kg N ha−1 (N), 100 kg N ha−1 + 50 kg P2O5 ha−1 (NP), 100 kg N ha−1 + 50 kg P2O5 ha−1 + 50 kg K2O ha−1 (NPK)]; (3) one integrated treatment [(50 kg N ha−1 + 25 kg P2O5 ha−1 + 25 K2O ha−1) + (50 kg N ha−1 from FYM)]; and (4) one organic treatment at10 Mg ha−1 FYM. Compared to the control treatment, the increase in SOC was 36, 33, and 19% greater in organic, integrated, and NPK treatments. 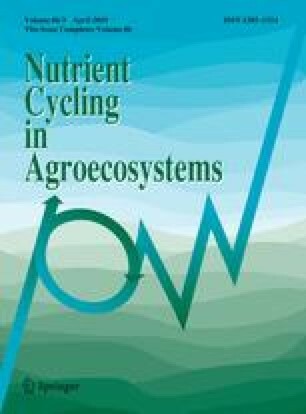 The 16-years application of fertilizers and/or FYM resulted in much greater changes in water soluble C (WSC), microbial biomass C (MBC), light fraction of C (LFC), and particulate organic matter (POM) than SOC. Of the SOC, the proportion of POM was highest (24–35%), which was followed by LFC (12–14%), MBC (4.6–6.6%), and WSC (0.6–0.8%). The application of fertilizers and/or FYM increased the mean weight diameter of soil aggregates; thus provided physical protection to SOC from decomposition. Our results suggests that the application of fertilizers and/or FYM helps to sequester C in the soil and that the labile fractions of C can be used as indicators to determine the amount of C sequestered as a result of different management practices. We are grateful to Mr. S. Thomas Bradley, Chemist, Gulf Coast Research and Education Center, University of Florida, Wimauma for proof reading the draft manuscript and offering valuable suggestions.